The confusion probably arises because there was some sort of debate in the early Hellenistic tradition about how to assign some of the sect-related rejoicing conditions to the signs. I know of three approaches. 1. Cancer/Leo hemisphere approach. Hephaistio as mentioned. 2. Masculine as diurnal, feminine as nocturnal. Ptolemy as mentioned. 3. Signs ruled by diurnal planets as diurnal, signs ruled by nocturnal planets as nocturnal. I think this one may have been a contender for more popular than the previous, and it is endorsed by Vettius Valens. However, the triplicity rulers scheme seems to suggest that 2. was more influential overall, and that it probably precedes Ptolemy. According the hemisphere's logic it should be feminine too. Not if sect and gender are being treated as separate concepts within the context of that approach. That Hephaistio seems to be treating them as separate seems to be confirmed when he talks about some of the signs like Virgo, which he lists as being diurnal and feminine. This goes back to my original point, which is that even though the later tradition ended up following Ptolemy in treating sect and gender as connected or equivalent, there was some sort of competing tradition for assigning sect to the signs in the early Hellenistic tradition that may have seen them as distinct concepts. In that scheme gender was assigned based on odd and even signs, but sect was assigned to each hemisphere based on the domicile assignments. This goes back to my original point, which is that even though the later tradition ended up following Ptolemy in treating sect and gender as connected or equivalent, there was some sort of competing tradition for assigning sect to the signs in the early Hellenistic tradition that may have seen them as distinct concepts. Sorry, but I'm not persuaded. Why some signs are not mentioned? And why nobody mentions this different idea of hairesis? I have almost all Bezza published and he never mentioned such a thing, and the same people wrote in the previous posts of this thread. I checked Teucer (in Rethorius, in Holden translation), which is really a different tradition of Hellenistic astrology and he says that Taurus is feminine and nocturnal and Gemini is diurnal and masculine. Teucer for sure did not depend on Ptolemy. we see competing traditions all the time... i am curious why that would be a difficult concept to grasp?? Diurnal: Leo, Virgo, Scorpio, Sagittarius, Capricorn. Nocturnal: Cancer, Aries, Aquarius, Pisces. And why nobody mentions this different idea of hairesis? It is not accurate to say that "nobody" mentions this idea. Knappich recognized and mentioned it, which is what started this thread, and Hand called attention to it as a possibility in the footnote I mentioned earlier. And which more ancient tradition considering that Hephaistio book is a comment to Tetrabiblos? Hephaistio is not a commentary on the Tetrabiblos. It draws heavily on the Tetrabiblos in some chapters, but it also draws heavily on other authors/traditions like Dorotheus. In the same chapter that deals with the signs at the beginning of Hephaistio he alternates between first listing the terms/bounds according to Dorotheus, and then he gives them according to Ptolemy. It is possible then that this alternative tradition for assigning sect to the signs of the zodiac came from Dorotheus or some other early author. Hephaistio also drew on and cites other early authors later in his work like Nechepso, Thrasyllus, Critodemus, and others. His text is a compilation from the works of many early authors then, although primarily from Ptolemy and Dorotheus. It is not clear to me that those passages that are supposed to be from Teucer in Rhetorius haven't been updated by Rhetorius, because they include some concepts that didn't tend to be emphasized as much until later in the tradition, like the concept of detriment. It is odd that sect is not mentioned at all in the same parallel passages by Valens when he talks about the signs in Anthology 1, 2, as those passages are also supposed to be derived from Teucer. So which one represents the earlier version, the one preserved by Valens, or the one preserved by Rhetorius? Who knows. Just to add 2 more by Manilius. 4. Aries - Virgo as diurnal, Libra - Pisces as nocturnal hemisphere approach. 5. Aries, Cancer, Leo, Scorpio, Sagittairus and Pisces as diurnal, the rest as nocturnal. This is the one he prefers and these are based on the trigons of Aries and Cancer - the signs of the spring equinox and summer solstice. Knappich couldn't have read Pingree's Hephaestio edition from 1973 since he published his astrological history in 1967 and died in 1970. It's possible, though, that he used the old Engelbrecht edition of Hephaestio, and from the fragmentary allusions he reconstructed a classification of signs related to the issue of parties (haireseis) - provided he read Ancient Greek -, which he considered the right definition of hairesis. However, I think a more plausible explanation is that he read something about the parties somewhere (e.g., in Bouché-Leclercq's handbook) but what he remembered better was Ptolemy's introduction of the solar and lunar halves, possibly in Pfaff's German translation. Just for the record: Ptolemy is the source of this division of the zodiac (even if he's not the originator of the theory); he doesn't use the expression hairesis here; Hephaestio doesn't lift this precept even though he copies or summarizes much of Ptolemy's Apotelesmatics; and the sporadic assignments in Hephaestio, collected by Chris above, would hardly make it possible to reconstruct the rationale without the aid of Ptolemy's text. He shows first the condition that comes up in Manilius of odd and even alternating gender. This seems to be the most popular rejoicing condition that went on to become one of the 3 sect conditions in the Medieval tradition. Although one could ascribe that to the influence of Ptolemy, the fact that Dorotheus also uses it, surely adds up (unless there is an interpolation? it comes in one of the natal books as well as in Book V). Reference to that condition also appears in the summary of Antiochus, Valens, Paulus and Rhetorius. Note that Valens and Dorotheus ascribe the triplicity rulers scheme to this specific sect condition. For example - ''When the zodiacal circle is subdivided according to similarities and differences, we find two sects, solar and lunar, day and night. The sun, being fiery, is most related to Aries, Leo, and Sagittarius, and this triangle of the sun is called “of the day-sect” because it too is fiery by nature.'' - Valens, V. Anthologia. Translated by Mark Riley. ''Chapter 28. Knowledge of masculine and feminine signs, eastern and western, and diurnal and nocturnal. ''Look at the diurnal and nocturnal signs; I will make clear to you the diurnal among them and the nocturnal. The diurnal among them: Aries and its triplicity, Leo and Sagittarius, are diurnal, and Gemini and its triplicity, Libra and Aquarius, are diurnal. The nocturnal: Taurus and its triplicity, Virgo and Capricorn, are nocturnal, and Cancer and its triplicity, Scorpio and Pisces, are nocturnal.'' in Chapter 4 of Book 5 - Sidonius, D., & Pingree, D. (1976). Carmen astrologicum. Pingree (Hrsg. ), Dorothei Sidonii Carmen Astrologicum, Leipzig. 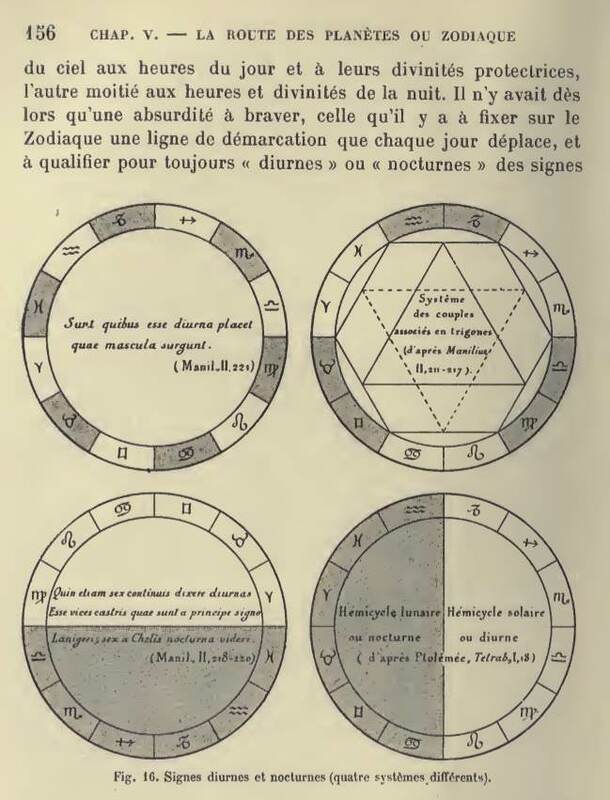 Bouché-Leclercq then lists the condition peculiar to Manilius where the triplicities of Aries and Cancer are diurnal. He then lists the hemisphere scheme mentioned by Manilius that Aries - Virgo are diurnal while the other hemisphere nocturnal. He finally lists the condition given by Ptolemy, which as Levente said it comes up first in his text, although he ascribes the doctrine to other people. The condition I mentioned before that comes up in Antiochus (diurnal stars rejoicing with diurnal rulers) does not seem to be related to the signs, but more to do with the rulers? So depending on whether your think that represents a sign rejoicing/sect condition, you have 4 or 5 sect conditions related to sign in the surviving Hellenistic sources.